Homemade with fresh red chillies, garlic, ginger, and coriander. Sonny has been making this sauce to accompany his momos for years. It was only when festival goers started begging us to take some home that we decided to jar it up, ready to add to the comfort of your condiment cupboard! Available in 180ml glass jars. We would LOVE to hear how you use yours! Tesco’s Pizza utterly and majestically transformed with Sonny’s Tibetan Kitchen Chilli Sauce. The bland offering became a glowing subject full of gentle fire. Try some …. Really peps up a boring cheese sandwich; adds some bite to egg mayonnaise; now I’m trying to find a way of adding it to hot chocolate! A member of our school staff brought Sonny’s Tibetan Chilli Sauce into work, all those who tried it thought it was incredible. 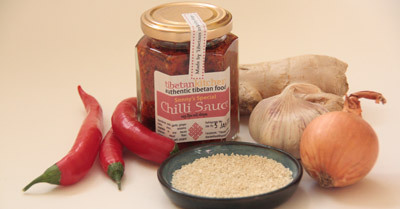 The sauce is hot but not overpowering and tastes fabulous, made with fresh ingredients it’s perfect when added to Oriental or Indian food and when used as an accompaniment to many dishes. Over 30 members of our staff now order jars of sauce directly from Sonny and Jane, the product is delivered straight to the premises.